The following narrative was written by my great grandfather, Alfred J. Turner, a fish merchant and fishing vessel owner, to his young brother Francis in London. 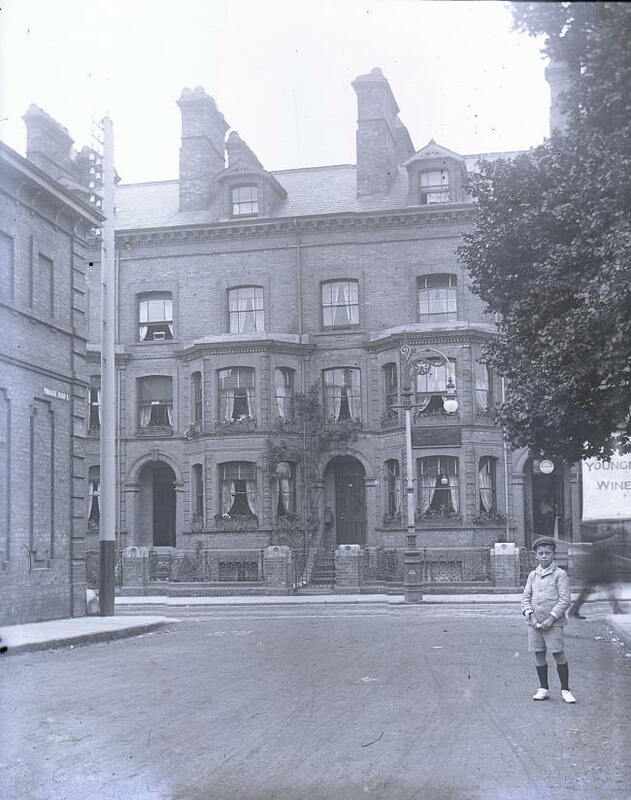 On 25th April 1916 A. J. was living with his family at 137 London Road South, between Windsor Road and Grosvenor Road. His family included his son Jack, mentioned in the narrative, who was my grandfather John P. Turner. It is believed that the photograph of 137 below was taken a few years before the bombardment. The photographer was standing in Parade Road South with his back to the sea (see map below) and the small dormer window in the attic must be from where they were able to see the British light cruisers give chase to the German battle squadron. For more detail about A. J. Turner himself. "This is a short and personal account so need not apologise for mentioning myself perhaps over much. "We went to bed Monday night at 11.00pm and at midnight were awakened by our aircraft guns firing at a Zepp. Went upstairs and saw the shells bursting but could not see Zepp. Beautiful starlight night. "All women wonderfully calm. Went down myself and dressed. Mrs. Henson went up to the 4th storey, shell struck house next door but one and fell in our back garden, blew up greenhouse, bicycle shed, all back windows blown in and all party walls blown down. "Mrs. Henson arrives downstairs as quickly as possible with Mrs. Spatchet. Bombardment increases in intensity, can hardly hear anyone speak with the screaming of shells and explosions everywhere. Mrs. Henson puts on kettle and Lily gets tea ready, Jack and I have a cigarette and consign all Germans alive to the place they belong to. "This continued nearly half an hour as near as I can guess but did not time it. The crash of our falling glass was terrific and the house filled with smoke till we wondered if we were afire. "After this there was a lull and then very heavy firing recommenced at sea and we knew there was a fight, so we all went up and saw our little torpedo boats destroyers steaming North to meet the Hun dreadnoughts. They passed in front of our house and a very few minutes afterwards the leader stopped and the whole line steamed round him, each boat firing a broadside (as she turned) at the Germans. It was magnificent but was not war. It was a case of a wasp stinging a tiger. "It was suicide to attack the enemy but in doing so they drew the fire from the town and the Huns fired their 12 inch guns at them but failed to hit them except once that I saw. "The columns of water were going up where the shells went into the sea exactly like very high church steeples all round our boats. There were 19 of our little things and it all happened about 4 to 5 miles from the beach. I would not have missed seeing it for £50. "When the Huns first saw the smoke of our fleet they turned away to the East but after verifying them to be only small boats they turned back Southwest to meet them. After our boats had turned away from the Goliaths they steamed very fast to the Southwest and were considerably faster than the big ships and after a time the torpedo boats emitted a very dense cloud of black oil smoke as if a heavy thundercloud had come right down o the sea for miles and they escaped under cover of it & the Kiel fleet went home “pursued by our light cruisers” (vide Admiralty report). "If the shell that fell in our garden had been 20 feet more south it would have gone clean through our house. A photographers 6 doors away demolished. Three houses demolished in Windsor Road on one side of us at the back and two in Cleveland Road at the other side of us. Extensive damage done close to us in London Road South. "The damage all over town very serious. Several shells went over 3 to 4 miles all round the town. Size of shells from 12 inches downwards. Several unexploded ones picked up in different places. "One struck the gable end of a terrace of cottages and went right through 13 houses and stuck in the ceiling of the 14th where it still remains. Two demolished, another severely wrecked everything in it destroyed except a photo of a silver cup presented to the tenant by the Kaiser and bearing his medallion on it! "The remarkable facts are that although there are thousands of pounds worth of damage done only 4 people were killed and under 20 wounded. A great many houses struck were empty. I finish with the motto of the Worshipful Company of Fishmongers, “All Praise be to God only”. "Mrs. Down at 10 Grosvenor Road was getting my mother downstairs and saw the shell burst in our back. The smoke dust and debris went higher than the roof and she told me she shrieked, “There goes our Alf!”"
Those mentioned in the text living at 137 at the time were A. J. Turner himself and his wife 'Lily', his son Jack (who would have been about 23), his elderly mother-in-law Mrs. Spatchet and Mrs. Henson, a widow who was companion to his wife. His elderly mother was living just around the corner at 10 Grosvenor Road. 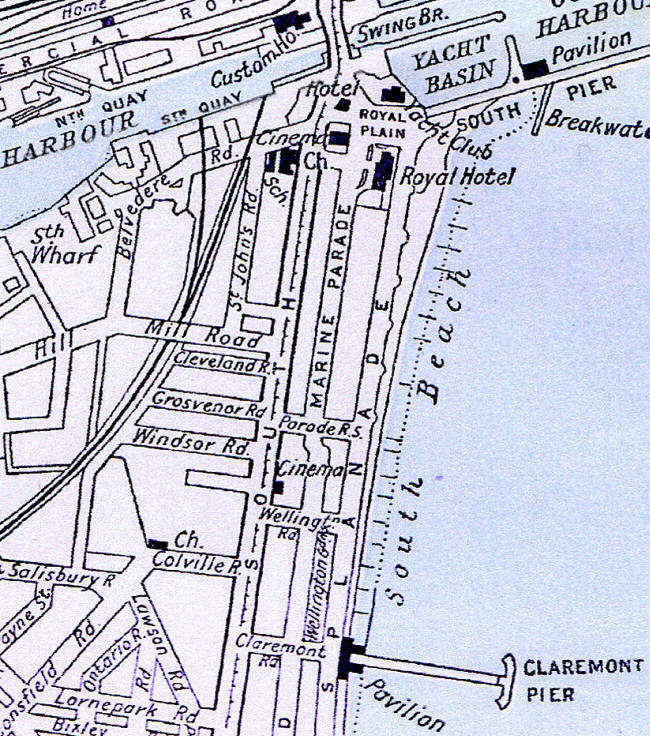 The 1920 map below might help to place the roads mentioned in the text.